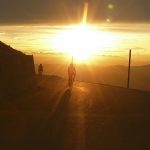 Last August, my friend Tim and I cycled Grand Colombier to see the sunrise. 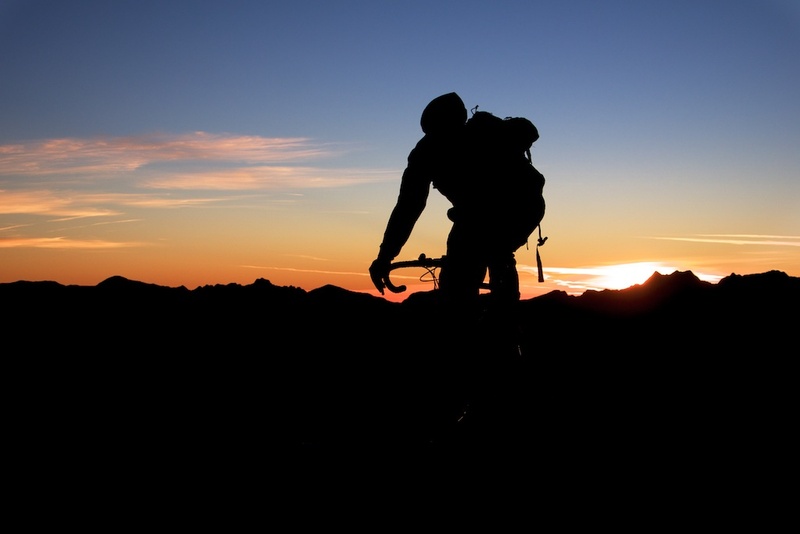 It was one of the best rides of the year and we immediately began brainstorming another candidate for a sunrise ascent. 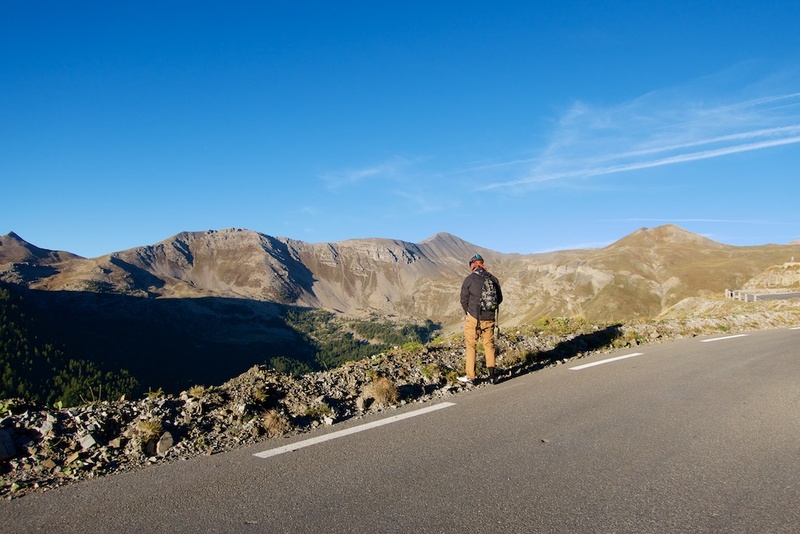 Cime de la Bonette – the highest paved road in France – seemed an obvious candidate. The route plan was simple. 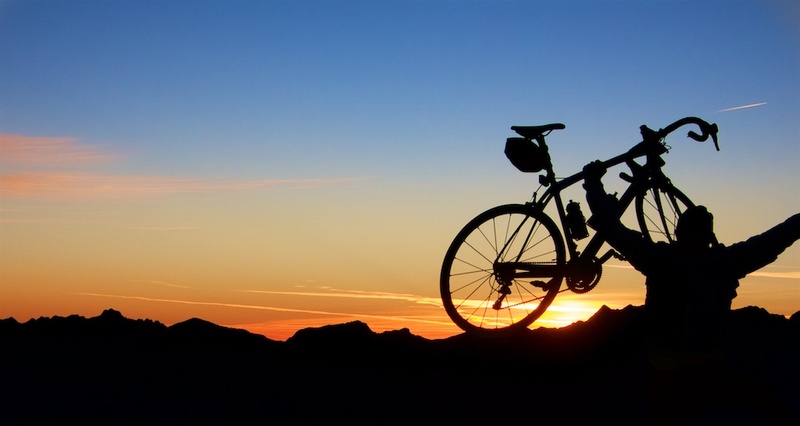 Cycle the entire south side starting from Saint-Étienne-de-Tinée. 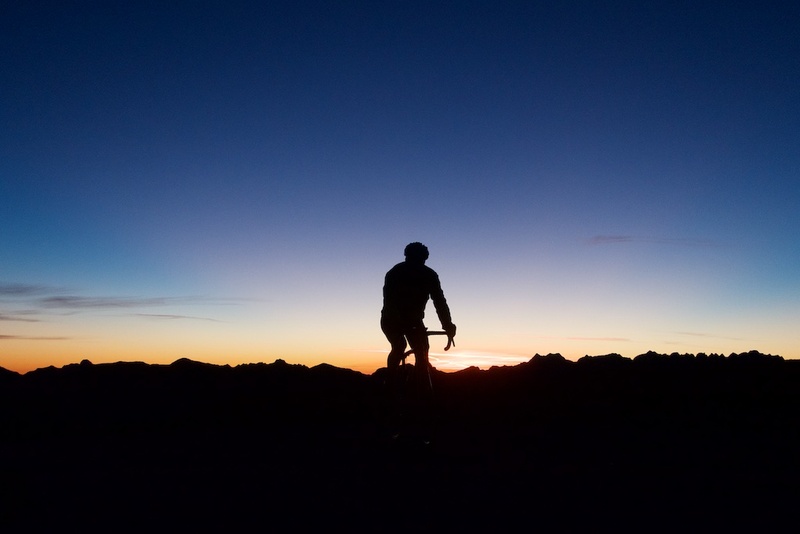 We started early enough with the goal of arriving at the summit 15-30 minutes before the sunrise. 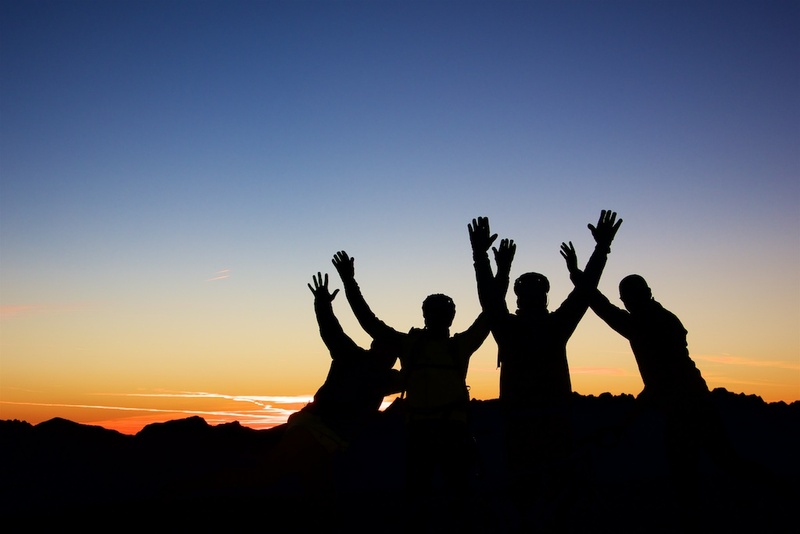 It was cold, but not freezing – it would be 0.5 Celsius at the summit. 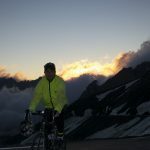 It had warmed up since two days previous when the cime loop at the summit had been briefly closed. 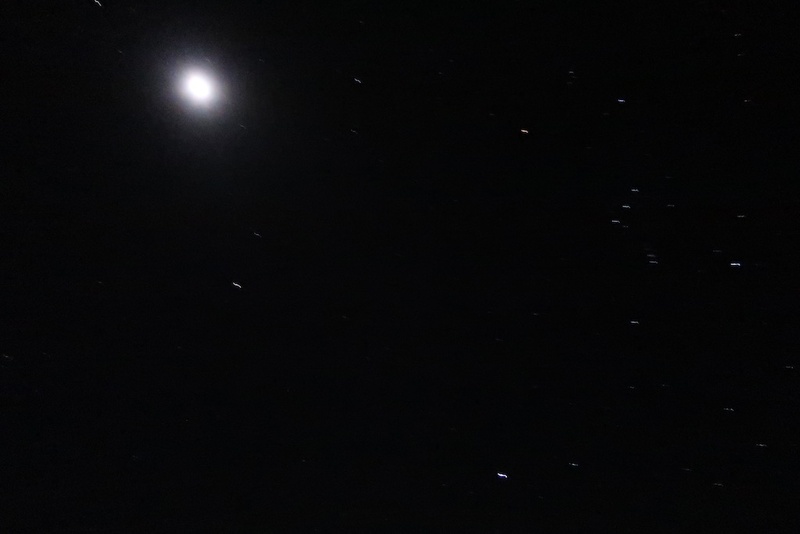 Moon and Orion with its distintive belt and Betelgeuse. 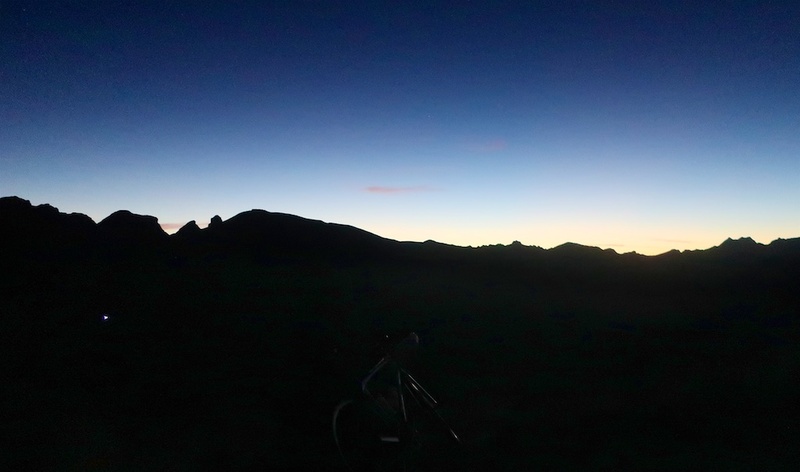 Perhaps 45 minutes or so before sunrise, the horizon started to become lighter. It was so peaceful. We saw zero cars going up. But we would hear some noise that I thought was chainsaws, but the guys swear was deer rutting. I would actually see four deer cross the road in front of me, including a male with a huge rack of horns. 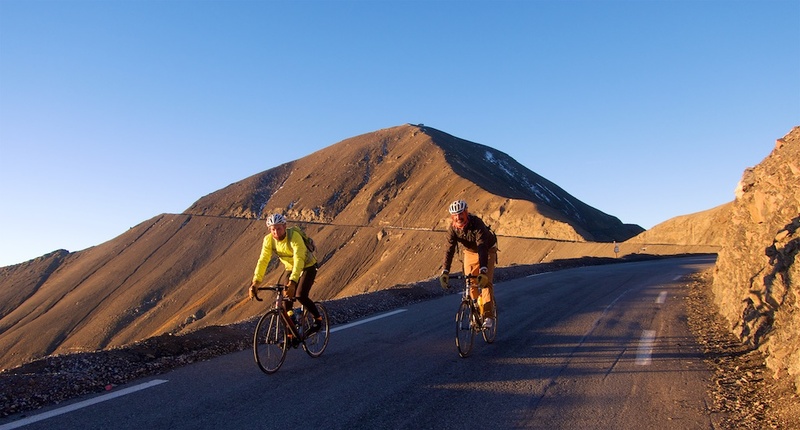 See here for details of Mont Ventoux at dawn. 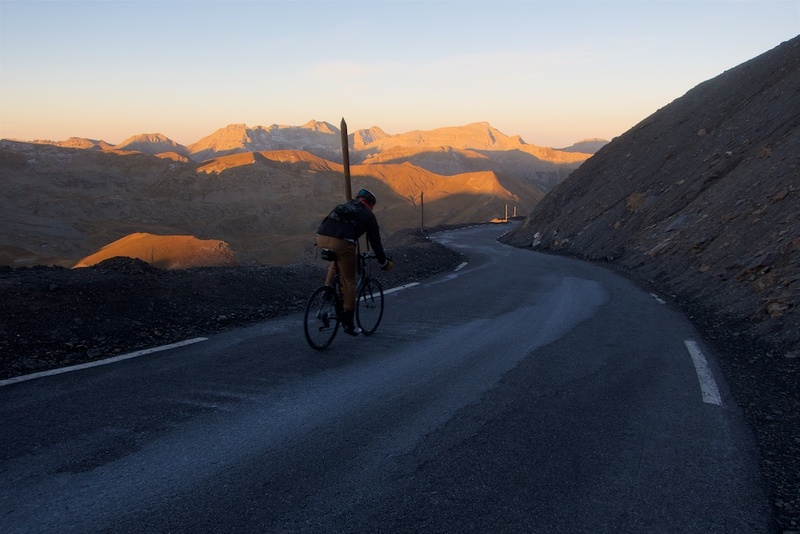 See here for Col du Galbier at dawn. 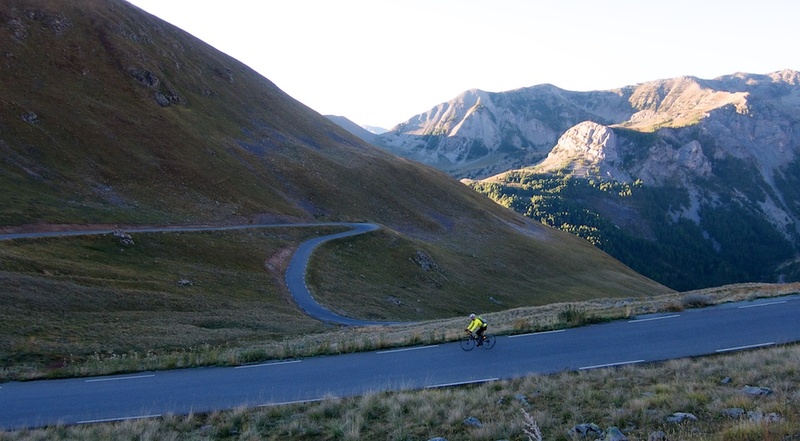 The road reaches Col de la Bonette (2715 metres) and descends the north side to Jausiers. But from Col de la Bonette a road loops around the round peak beside the col. This extension reaches a high-point of 2802 metres. It certainly seems this extra loop above the col was built solely to be higher than Col de l’Iseran (2764 metres) to become the highest paved road in France. 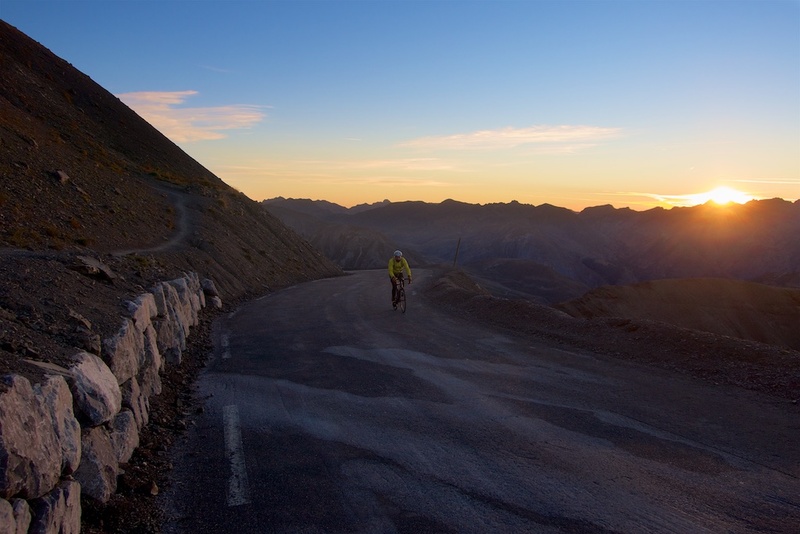 There are several other cols near the summit and some gravel riding options. 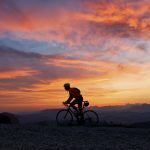 See here for details of four different Bonette routes. There is a stele at the exact highpoint of road. I couldn’t rouse up any enthusiasm to hike higher to the top of the mound (2860 meres) so we began our descent by riding the other side of the loop down to the col.
Alfie forgot leggings so he dressed formally. The descent was beautiful. And we got to actually see this amazing route. 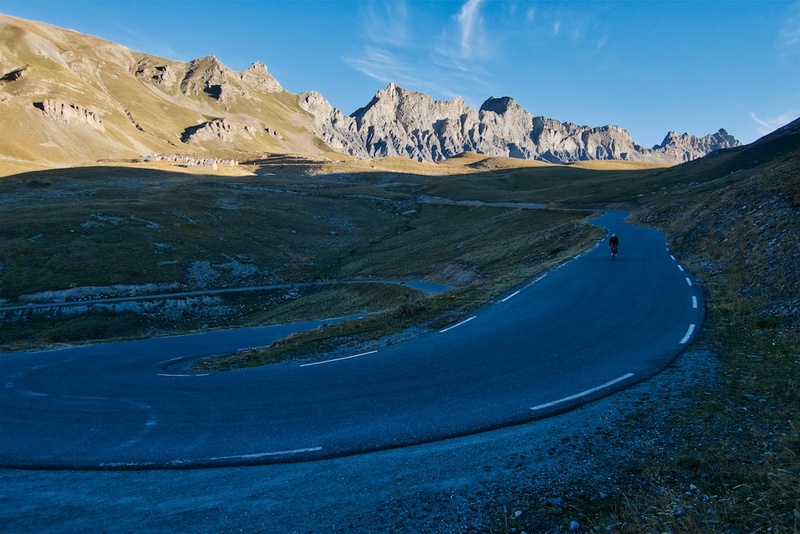 In the photo below you can clearly see the road that loops around the mound to go above Col de la Bonette (col is lower right). This was so much fun. Bucket list fun. Thanks to Tim for organising and to Alfie and Richard for the great company. 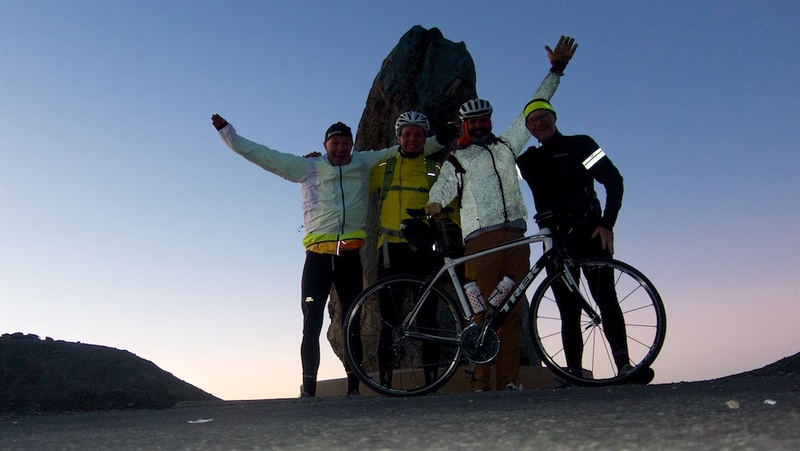 Hmmmm, what’s the best summit for our next sunrise ride? Great posts. Have used so much of your info. We went up last year the day after it opened. Marmots sitting on the road. No cars or motorbikes and massive 3 metre high snow walls near the top. A few ski mountaineers on the huge snow fields. One of my favorite rides. Brilliant. Even got a pee shot in. Cheryl will be proud! Jolie performance et il devait pas faire chaud au sommet ! 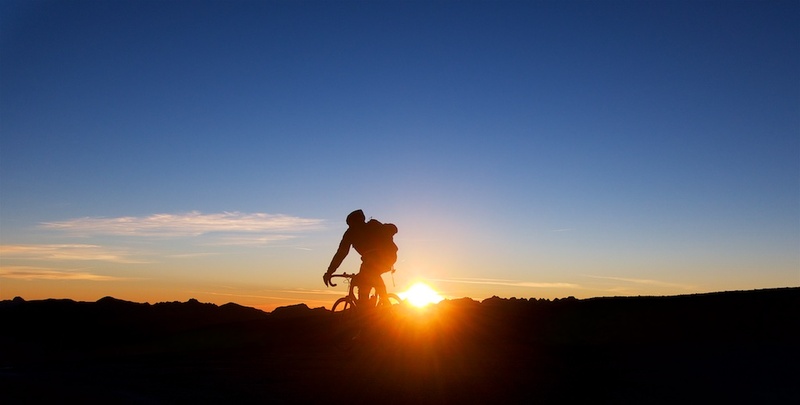 My suggestion for your next sunrise ride would be Mannlichen, above Grindelwald in Switzerland. Or in the Jura, Mont Chasseral would be great. Chris, thanks for the ideas. Do you think the sun would be blocked for too long by the Wetterhorn/Eiger etc. on Männlichen? My theory has been to have a clear south-east view from the summit.